American rock band POP EVIL have been hard at work in the studio this summer working on an all new LP due out early next year. The band has brought on veteran producer Kato Khandwala and have been hard at work since early June. The band spent most of the summer in Nashville, TN at Studio A in Sound Emporium Studios and will finish up the album in Los Angeles, CA in the coming weeks. The band has released a short studio video which premiered via SiriusXM Octane earlier this week and you can check it out HERE. The yet to be titled LP will be the follow up to Up, which debuted at #1 on the Billboard US Independent Albums, #3 on the Billboard Top Hard Rock Albums and #25 on the Billboard Top 200 in the week of its release. Up produced four top 5 singles with "Footsteps", "If Only For Now", "Ways To Get High" and "Take It All". “Footsteps” not only reached number one but went on to be the longest #1 single of the band's career. The band hasn't’ let up on its road dog reputation, virtually staying on the road for the past two years since their last LP. 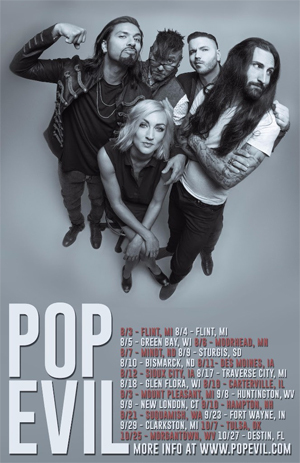 POP EVIL will continue that trend and be on the road all summer starting with two SOLD OUT shows at The Machine Shop in Flint, MI. Other highlights include supporting BUSH at the Blue Stream Amphitheater in Moorhead, MN, STURGIS 2017 with OZZY OSBOURNE, Moonstock Music Festival with PAPA ROACH and RIFF Fest with ROB ZOMBIE.